Something cool happened last night. 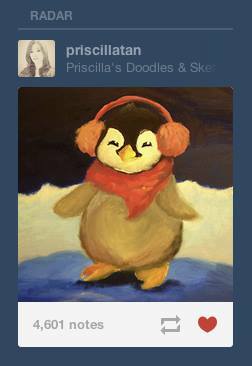 One of my paintings (yes, of a penguin) got featured on the Tumblr Radar! Overnight, that post garnered more than 4k “love notes” (in Facebook’s terms – LIKES) and hundreds “reblogged” (in Twitter’s term – “Retweets”). As I am typing this, it has grown to more than 6.6k. My Tumblelog also gained hundreds of new followers overnight. For those who are not Tumblr users, the Radar is an editorial post review, curated by the Tumblr team. Once on radar, the post is highlighted on other users’ dashboard for a period of time. I signed up on Tumblr a few years ago but wasn’t active until recently. The blog was meant to be used as a ‘creative journal’ to keep & share some random sketches, ideas and paintings I do. I hardly cross-amplify the content on my other social networks, so it is interesting how things can ‘go viral’ overnight. I just read articles/ tips about “How to Get Featured on Tumblr Radar” and my newly set-up blog met almost NONE of the criteria. And no, I don’t know any one from the Editorial team either. (And as I finished typing this post, the little penguin has 7.4k “LOVE NOTES”) Woohoo! This entry was posted in Life Stories, Technology & Digital by Priscilla Tan. Bookmark the permalink.